Well, it has already snowed here in Minnesota. But that won't stop me from posting another fall dessert. I'm back with another creation using pears, the unsung hero of fall fruit. I loved this tart SO MUCH. Frankly, the crust was my favorite part, but the whole thing together was just irresistible. 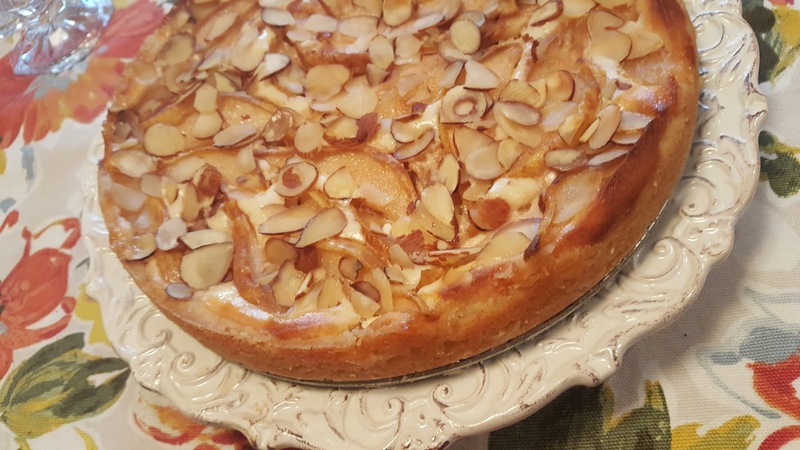 A sugar cookie crust, topped with cream cheese, pears and crunchy almonds - what is not to love? I even ate this for breakfast one morning as I admitted on Instagram. I didn't even bother to peel the pears for the recipe, although the original did call for peeling. But pear peels are so thin, that it doesn't really make a difference; just adds a lot more work. I'd rather save my energy for other pursuits - like making more pear desserts. 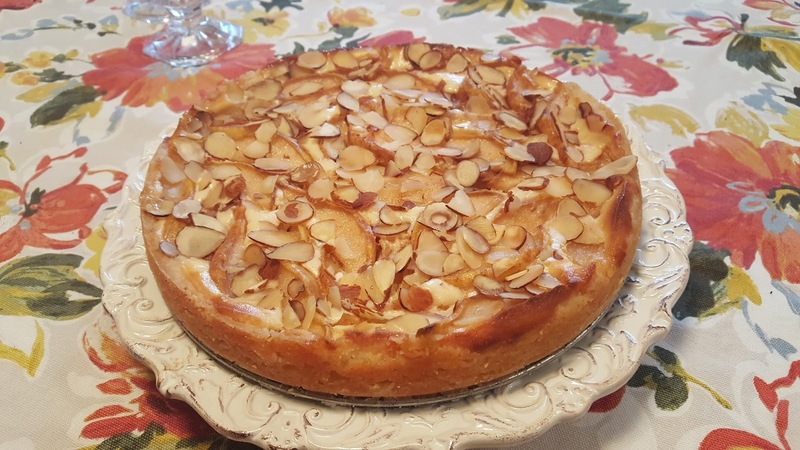 I'm sure pears are still readily available no matter where you live, so keep celebrating fall and make this dessert! Find more great stuff at Inspiration Monday, Mix it Up, Busy Monday, Inspire Me, Inspire Me 2, Create Link Inspire, Fabulous, Hearth and Soul, Wow Me, Wow Us. For the crust, using an electric mixer, beat the butter and sugar on medium speed until light and fluffy. Add the flour, and mix well. Spread onto the bottom and about an inch up the sides of a greased 9-inch round springform pan. For the filling, beat the cream cheese and sugar until blended. (You can use the same bowl from the crust, no problem!) Add the egg and vanilla, and mix well. Spread evenly over the crust. For the topping, toss pears with the sugar and cinnamon then arrange the pears on top of the cream cheese filling. Sprinkle with almonds. Bake at 425 for 10 minutes. Reduce the oven temperature to 375. Bake for 25-35 minutes or until set. Cool on a wire rack. Loosen the sides from the pan. Cover and refrigerate at least 3 hours before serving. Makes 12 servings. You had me at sugar cookie crust, but honestly this whole lovely tart sounds amazing! Thank you so much for sharing this wonderful dessert with us at the Hearth and Soul Link Party, Sara!